Although not related to Steve McQueen, a rare 50th anniversary limited edition Shelby Cobra was taken home by a McQueen. Steve McQueen wasn’t allowed to own a Shelby Cobra because studio contracts prohibited the highest-paid movie star from owning one of the high-performance roadsters. McQueen was a fan of performance cars and when given the opportunity to drive in a movie, he performed many of his own stunts. It’s a bit ironic that a McQueen will once again be behind the wheel of a Shelby Cobra as a result of the 2012 Win-A-Shelby raffle. Ronald McQueen won’t be as big a celebrity as Steve McQueen, who was best known for driving a Ford Mustang during the action-packed car chase scene in Bullit. But he will certainly get attention when he pulls up in a rare, 50th anniversary Shelby Cobra continuation car in his home state of Pennsylvania. McQueen won the rare car in the 2012 Win-A-Shelby raffle hosted by the Carroll Shelby Foundation. The raffle offered enthusiasts a shot at the small block, limited edition Cobra and a McQueen was the lucky winner. In honor of the 50th anniversary of the Shelby Cobra, Shelby American and the Carroll Shelby Foundation celebrated the golden anniversary milestone by offering 50 of the limited edition cars. The rare roadsters are painted "Shelby black" and filled with a premium wine colored leather interior and special badges. 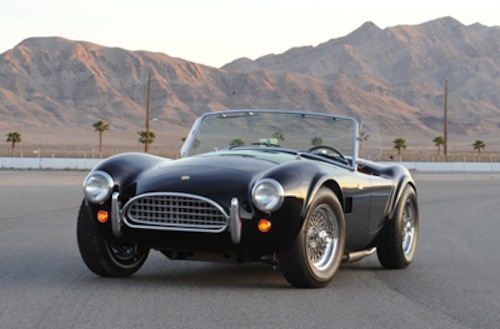 The new owner’s small-block Cobra will be documented in the official Shelby registry. Steve McQueen was a fan of the Shelby Cobra, and would have certainly jumped at the chance to own one. Legend says he visited Carroll Shelby at his Venice, Calif. facility throughout the 1960s, and even though McQueen couldn’t own one, Carroll Shelby lent him the CSX2174 to cruise around Southern California. He would have loved to own a Shelby Cobra and would have been worth a fortune today if purchased by a collector. Steve McQueens Ferrari 275 GTB4 recently found its way back home to Maranello. The new owner contacted Ferrari’s Classiche department to have the iconic car restored back to its original specifications. Along with vintage Ferrari’s, the Shelby Cobra is one of the most sought-after collectible vehicles on the planet. Ronald McQueen was able to take home a very rare 50th anniversary Shelby Cobra and own piece of Shelby’s automotive history.